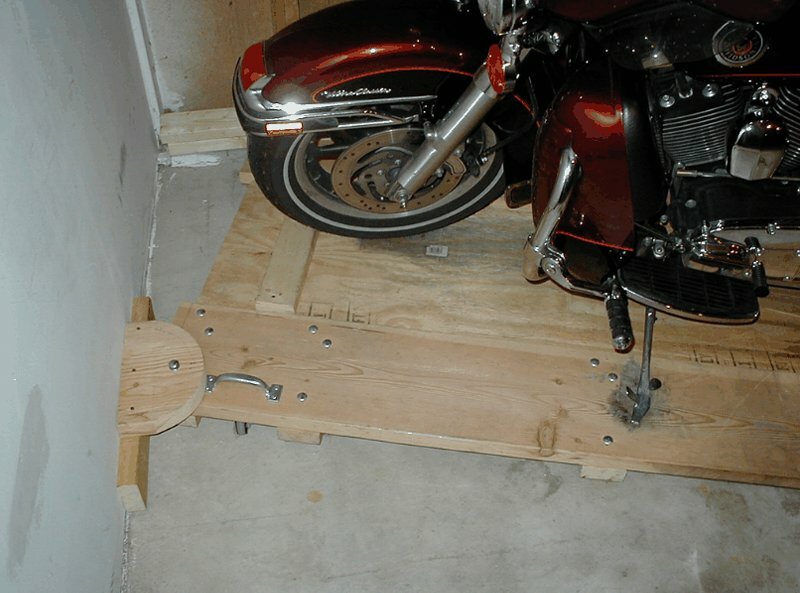 Over time a few people have inquired about the cart that I use to store my cycle on in my garage. I use it on a daily basis and it has served me well. I wasn't sure how long it would last but after more than two years and a couple bikes it seems to be holding up fine. I literally put it together in a few hours after I got all the materials together. It consists of nothing more than standard boards, carriage bolts, lag bolts, casters, and a pipe flange (at least that's what I'm calling it). 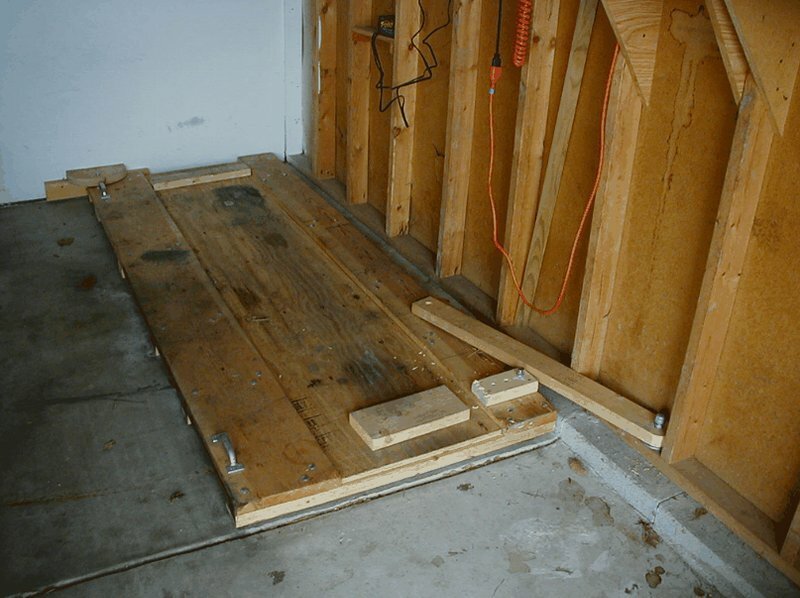 The cart is built as close to the ground as I could get it but you'll still need a piece of 2x6 to get you up on to it. Not a big deal though. I just kept a piece around and use it to stop the back tire when it's on the cart and use it to ride up onto when the bike is off the cart. Overall the total rise to get onto the cart is about 3" which with the 2x6 there is not an issue at all. The casters lift the cart up enough to get the boards off the floor and give clearance for the bolts that would the hole thing together. You couldn't use too small of casters or it just wouldn't hold. I had the HD Ultra on this thing for over 2 years and it held up fine but I did have to go to steel casters in the back because the cheap rubber wheel ones would eventually give out. The cart is built a little odd in that I used a wider board on the low side of the bike to allow for the kick stand. This worked perfect with the Harley but I had to mod it a little to accommodate for the fact that the ST isn't as wide as the Harley. The nice thing it is still wide enough to keep the wife from running into my saddlebags or mirrors when she parks next to it. For me it's just about the perfect width and length for just about any bike. And if it can hold an HD Ultra it'll hold just about anything. You can pick your own width and length if you want and just about anyone can look at this and put one together themselves in very little time. The two things that take a little time is the support in the back that keeps the cart from swinging left or right when you come up on it and it will so you'll want the support. The hinge in the front is the second thing. Initially I just wedged the front but putting the hinge on it made all the difference and made it a lot easier to get in and out. These two additions made it custom to my garage a little but I'm better that anyone could see a way to do it in there garage if they're wedged into a corner like I am here. Cut the length you want for your cart and decide on a width. My cart is 97" long and 38" wide so that accommodates the length including the bags and the same goes for the width. I then laid down the 2x12 and the 2x8 and spaced them at the width I wanted to start laying out the casters and the 2x4's. You want to distribute the wheels evenly to distribute the weight. I put the casters 2" in from the outside edge and then tried to space them evenly but I also had accounted for where I was going to place the 2x4's. 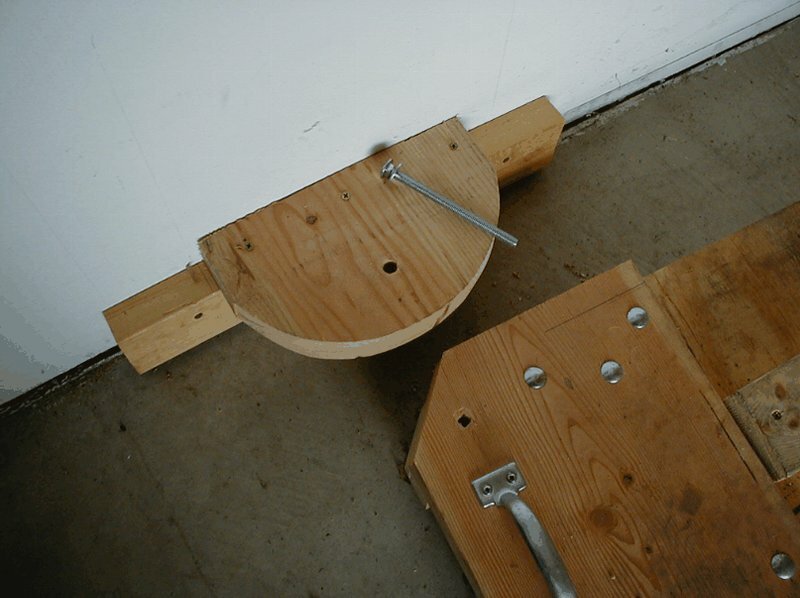 The wheels go in between the 2x4's so that you keep the rise to a minimum. Just mark where you want them now and you can pre-drill the holes if you want but I would wait until the frame is together. Now cut your 2x4's to length and decide where you're going to put them. When I made mine you'll notice they are not evenly spaced along the bottom. That's because I put them where there was a lot of weight which is the rear wheel, the kick stand, and the front wheel. Put one at the front and the back. Then use the other four for the wheels and kick stand. I put to in the area of the rear wheel. Once you know where you want to put them drill 3 holes on each side of the 2x4's so you can fasten them to the 2x12 and the 2x8. Since they are carriage bolts it makes a nice finish on the top so you don't have to worry about snagging anything on them. I also offset the holes to try and not cause any weak points in the studs. Then bolts the frame together and put on the flat and lock washers. Pre-drill the holes for your lag bolts, and then bolt them into place. 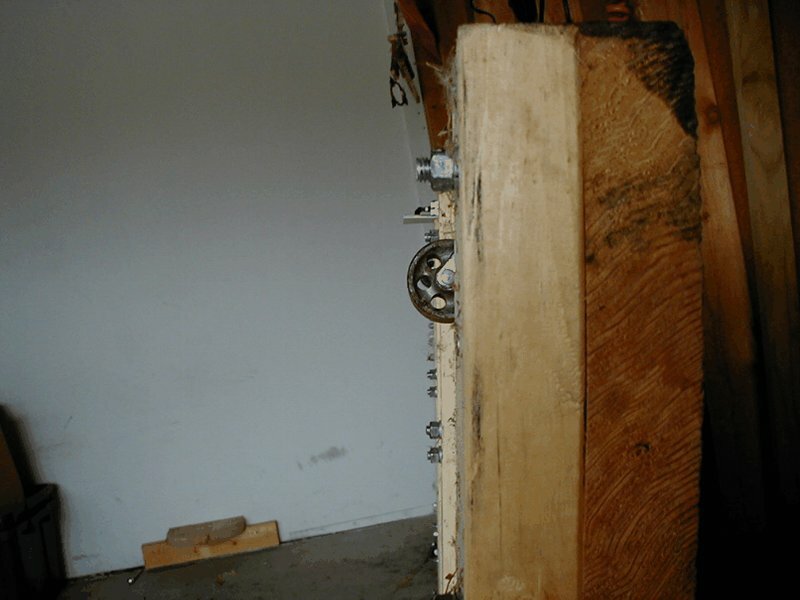 I just centered the wheels between the 2x4's and bolted them on 2" from the outside edge. You can now put the cart face up on the floor. You can then cut the plywood to width and drop it in on top of the frame and between the side boards. The width and length will depend on what you chose for your width and length. I cut mine and it sorted of wedged in there so I didn't even fasten it down. I can remove it when I want. 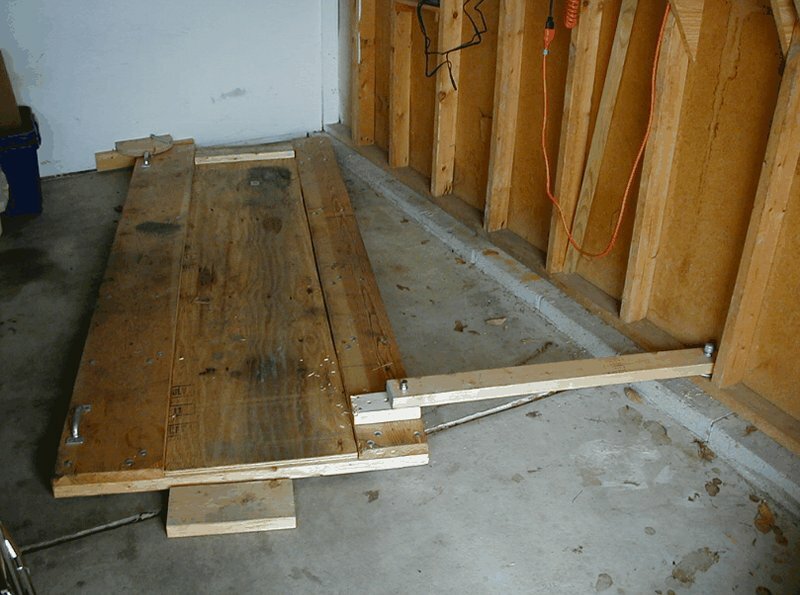 You could put a couple lats in the bottom and straddle a 2x4 to keep it from sliding or drop in a few drywall screws. 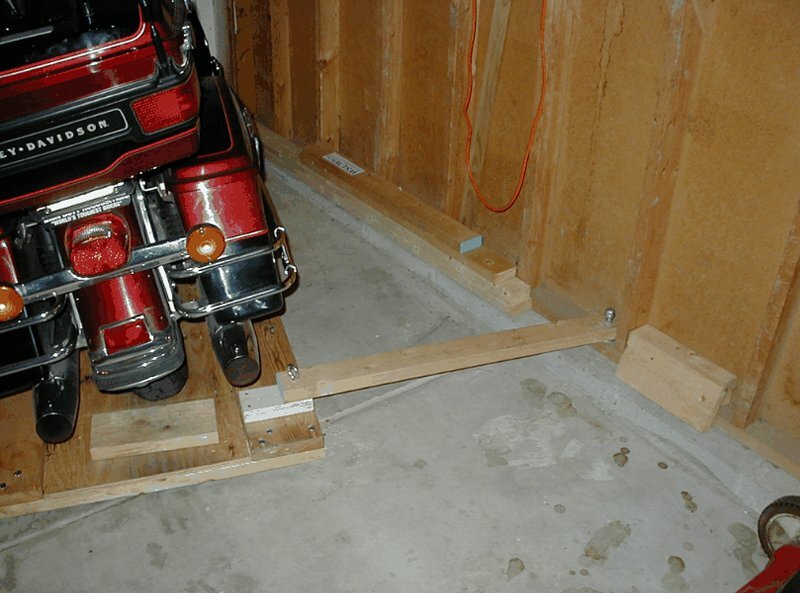 Put a 2x4 across the front to stop the front wheel. You'll want to do this, trust me. 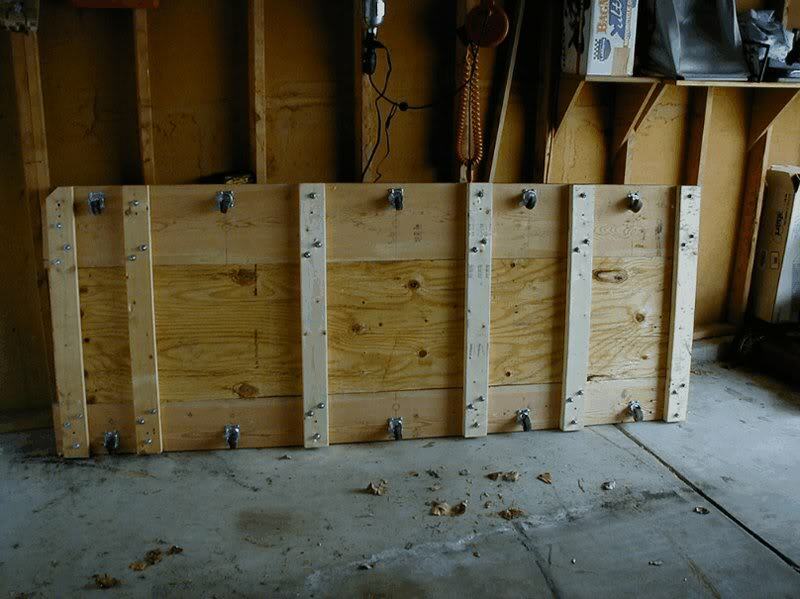 Use a few 2" drywall screws to fasten in down to the plywood. Now make the hinge. Cut the corner off at a 45. 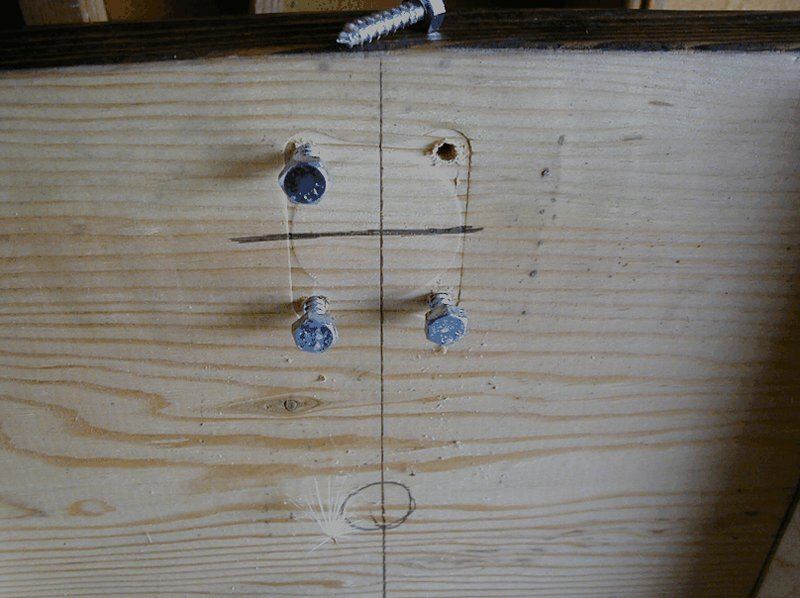 Then screw a piece of 2x4 to a couple studs in the wall with some 2 1/2" drywall screws and screw a half circle piece of 2x6 on top of the 2x4 so that it so that it sticks out perpendicular to the wall. Line the corner up underneath the half circle and drill a hole through it. Use a carriage bolt here but put a washer on first because you don't want the head to grab onto the wood. Then fasten the bottom of the bolt just hand tight so that the cart can pivot here without binding. Now you can make the back support. Find the angle you want to pull the cart out to and then cut a 2x4 that will go from the cart to the wall. You might want to cut the end of the board in a half circle so you can turn easy. Put a small piece of a 2x4 on the end of the cart and drill a few holes in it evenly spaced then screw it to the cart. Now cut drill a hole in the support board for a carriage bolt to go through it and into the board you drilled on the cart. On the other end of the support board drill a 1" hole for the pipe to go through. Fasten the pipe flange to the base board on the garage wall. Screw the pipe into the pipe flange, put the 2x4 onto the pipe, and then put the pipe cap on. Now the board will pivot on the pipe because you rounded the end of the board. Now screw a handle to the end of the cart where you pull it out. I can pull it out with the handle and push it in by pushing on the bike being careful not to high side the bike in the process. The fiberglass board I put on the floor is flexible and thin but it protects the floor from the steel rollers. That's pretty much it. This is just a rough draft design because not everyone has the same garage. 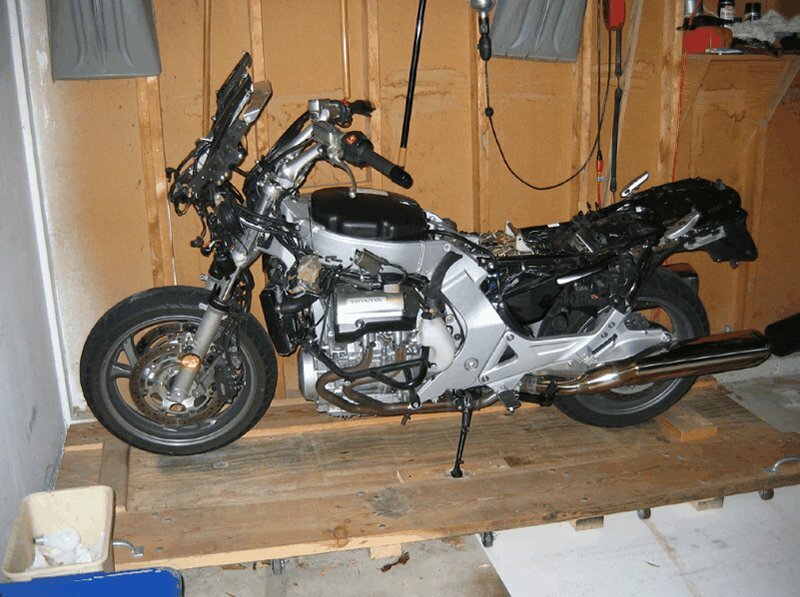 It is great for me because I never bang into the garage and never mess up my paint. It's not hard to bring in and out and it cuts down my parking time to about 30 seconds. If you make one let me know. If you need more details let me know since I put this together pretty fast. This isn't brain surgery though so I'm hoping the pictures give enough detail. I refined this design over a couple years and I think it works very well for the price.